Discernment ("discerning of spirits", 1 Corinthians 12:10) it is a gift that the Holy Spirit gives for the edification of the body (1 Corinthians 14:12). Now, discernment is also a skill that all Christians should employ. Each individual believer is supposed to test the spirits so that one can see if what one is learning is good or untrue. (1 John 4:1, Acts 17:11, 1 Thessalonians 5:21). However, some Christians have been given 'an extra dose' of discernment if you will, in the form of the Spirit's gift. Sadly, many churches dismiss the existence of this gift as expired. Other churches just ignore the gift and its operation in the church. Others over-rely on the gift and see evil spirits around every corner and wind up focusing on demons instead of Jesus. It is my stance that the gift of discernment is a permanent, edifying gift (as opposed to a temporary sign gift such as tongues, prophecies, or healing). It is in operation today in some believers- as a gift from the Spirit. 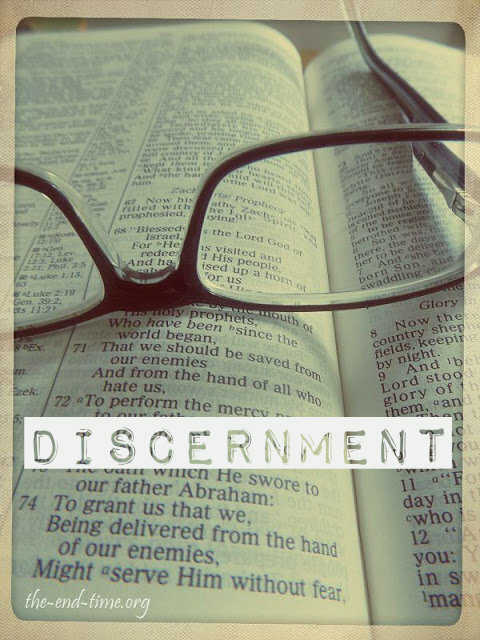 So, what IS discernment exactly? It's obvious to see how the gift of teaching, serving, exhorting, and mercy and administration operate in the church. But how is discernment supposed to operate in a local body for the edification of believers? This two-part series examines this question. If you search the internet for help on the practical uses and application of the gift of discernment in the local body, you will admittedly get all sorts of wacky theories in your results. The global church hasn't been very helpful on how the gift of discernment should operate in the local body, and that oversight has left the door wide open to all sorts of approaches. What we do know is that all the gifts are supposed to edify the body. People usually think that the gift of discernment is just a demon-detector. It can be, but not solely and not often. Discerning of spirits means the person is attuned to whether someone is speaking from the Spirit of God or from another spirit, and this usually applies to biblical wisdom. Here are some verses that focus on discernment, both the personal skill we all should hone, and the gift given to some for the edification of the body. And it is my prayer that your love may abound more and more, with knowledge and all discernment, so that you may approve what is excellent, and so be pure and blameless for the day of Christ, (Philippians 1:9-10). To another the working of miracles, to another prophecy, to another the ability to distinguish between spirits, to another various kinds of tongues, to another the interpretation of tongues. (1 Corinthians 12:10). Another example is from myself. It was a similar situation. I was a member of a small Sunday School class. One day, an older man and an older woman not members of the church and unfamiliar to me, entered and sat down. A few people seemed to know them, from long ago. Immediately I got a bad feeling, and as a few more minutes went on, the feeling became worse. The man replied to a Sunday School Curriculum question and I could 'hear' and 'know' that his answer was from a different spirit. He seemed to latch on to me, and our eyes locked. He continued speaking, but it seemed more like a different language or an enchantment than a normal reply to a biblical question. I kept my eyes on him, said nothing, and prayed in my mind very hard. He continued speaking, almost seemingly in tongues. I don't know what he said, it was in English, but it was from such a different spirit it might as well have been tongues. It sounded to my discerning ears like Polish, a language with a lot of sibilants. Finally he stopped and I stared intently at him and prayed in my mind. The class was over soon and he chose not to attend the service, but left with his woman friend. Afterward another person in the class said he knew and felt something going on between us, and noticed the atmosphere had thickened. I said it was spiritual warfare but it was over now. I was glad he spoke up because that way it was confirmed to me that it wasn't just my imagination as to what had happened. These kinds of things don't happen often, but they do happen. Paul knew that a slave girl saying something perfectly normal was possessed by a demon. (Acts 16:16-18). Peter knew Ananias was lying to him (to the Spirit, Acts 5:1-3). Another time Paul looked intently at a crippled man and knew he had the faith to be healed. (Acts 14:9). However the skill of discernment and the gift given to some more often means being able to compare what is being taught to scripture and testing accurately to see if it is from the Holy Spirit or another spirit. How does the gift work in the local church? Imagine in your mind discernment people standing watch alone at a high forward outpost, surveying the military field for invaders. Or watching from a Forest Fire tower, spotting smoke. You can see the invaders or the smoke much earlier than can the people on the ground, busy in the fort. You sound an alarm, saying "They are coming, they are on the horizon." Or, "I see smoke!" If your church elders have observed you and confirmed you have the gift, they will (hopefully) listen and take action. Others, sadly, will not listen to you until or unless they can see the flames, but by then often it's too late, a lot of damage has been done. Discernment people see and know things earlier. The early spotting helps protect the church, or alternately helps build someone up in faith as in spotting a promising young seminary candidate full of faith, or a young woman possessing unusual wisdom. More tomorrow on specific steps in using the gift of "Discerning of Spirits". GotQuestions: How Can I Develop My Discernment? This series on discernment is truly necessary; I hope many read it. Discernment, yes, a permanent spiritual gift from the Holy Spirit, given to those whom HE chooses. No, not every believer has it. Every believer can learn to discern truth from error from the word, but only those whom the Spirit chooses are given the spiritual gift to have ability above and beyond the rest of the body. "Others, sadly, will not listen to you until or unless they can see the flames, but by then often it's too late, a lot of damage has been done. Discernment people see and know things earlier. The early spotting helps protect the church..."
That sums up our experience for our entire time as believers, in a nutshell. My husband and I both have the actual Holy Spirit given gift of discernment. We always bring our concerns to the leadership when we see or perceive something that is not from God, with the intent to protect the church. Sadly, what we have found through long experience that pastors and elders do not listen. I've also had - on a - thankfully only - rare occasion - an actual discernment of a demonic entity experience. Those are stomach churners. I have found that many in our church--a large church in the Southwest--are afraid of the gift of discernment. This includes members of our pastoral staff, staff members, lay leadership (deacons and elders), and church members. A number of years ago, our church was searching for a new pastor. One of the candidates came from a large church in the South and spoke. I knew there was something wrong--I could not put my finger on it but it was just . . . wrong. My Son felt the same way (he also has the gift of discernment) even though he was a teenager at the time. I asked questions of deacons and was met with a stony-faced stare, as if I had suggested that we burn the ole boy at the stake. My questions were simple and direct. Then, in the weeks following the candidate's sermon, we began to be barraged with a lot of people who knew the candidate--had gone to school with him, had been members of his church, and so forth. We were told how we would learn so much about the Bible from him. This barrage continued until time for the church's vote on the man. It was a 96 percent vote in favor of calling him. Then the man moderating the church business session took an unprecedented step for our church. He made a motion that the church business meeting minutes reflect that the call was unanimous. Seconded. Passed. The call was issued. Long story short: the 20-years of this man's leadership proved to be disastrous. Huge amounts of money were spent, not to go forward, but to accommodate the man's lack of spiritual leadership. Sermon series on becoming Christlike (which he seemed not to know anything about) resulted in flesh-driven efforts designed to show what great people we were, but not so much directing people toward the Savior. The man has retired. We have called a properly Spirit-filled pastor, and our church has now returned to godly preaching and ministry. Our church is now increasing, not decreasing, in membership. We are once again on a solid footing of Scripture, prayer, and proper Holy Spirit-led leadership. Yet, many in our church are still afraid of the spiritual gift of discernment. 20 years...you are very patient. I'm glad things are better now!